It's not every day you are fortunate enough to see a brown that breaks the 30-inch mark. I'm not sure I've ever seen one in person till now. Mid to upper twenties a number of times, both on my line and on others' fishing with me. But not 30. There was one time that I didn't have a measuring tape for a fish - guess I'll always have to wonder just how close it was. The other day I was on board Josh Steinmetz's boat of Steinmetz Outfitters. I'll be working under Josh running guided trips from my own boat starting this year (more on that another day). 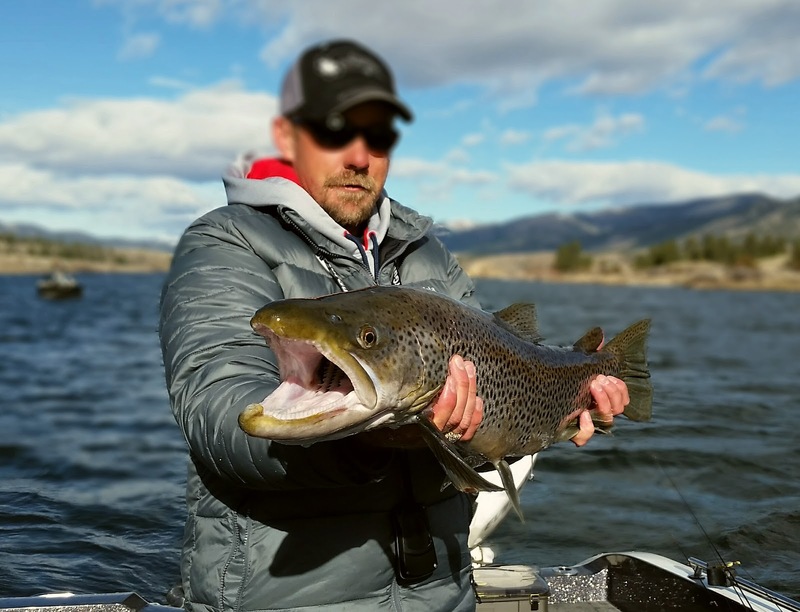 We were fishing upper Holter Lake on the Missouri River, targeting the staging spring walleye, and hoping for one of those elusive yellow beasts of spring. 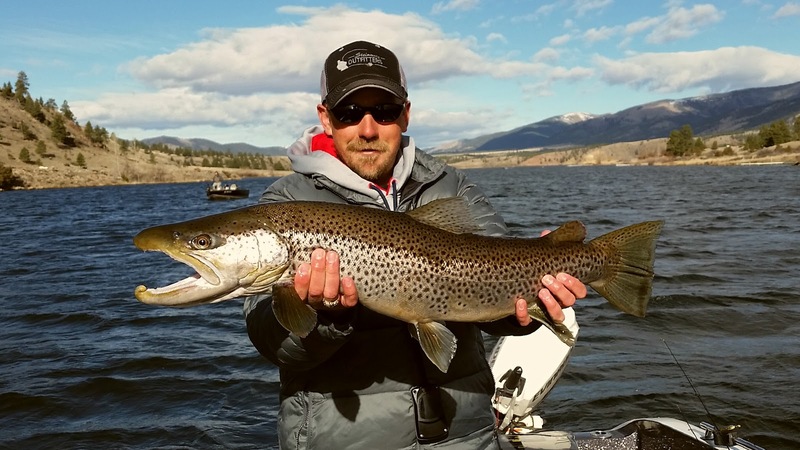 Ryan McCourtney, a guide at Headhunters Fly Shop in Craig and a friend of Josh's, was with us briefly in the morning before stepping off to join a guy in another boat. Josh hooked the brute on his third cast. I know because I was rigging a rod - hadn't made even one cast yet - and was watching Josh work his jig while I ran line through my guides. I saw the hit, the hookset, and the telltale bend in the St. Croix rod. If Ryan hadn't still been on the boat, I would have been on net duty. Instead I was able to jump to the gunwale, catch some footage of the battle, and snap pics when the fish came on board. From that I was able to put together the short video below. Like with any uncommonly big fish (and I don't care who you are), the three of us bumbled around the boat all weak in the knees while trying to make decisions through clouded minds after our first glimpse of flash beneath the water. Big fish are always within a split second of being gone it seems. So much has to go right. Each one is somewhat of a miracle. And this one was no different. Even once it was in the net the jig it had taken just fell from his jaw like it hadn't ever been attached - mangled and the bend of the hook wide open. The fish was one of Josh's lifetime best. Possibly his first personal brown to break 30 inches. We laid the fish on a measuring board, but when we went for the digital scales the batteries had fallen out into a gear bag. In all likelihood the fish was around a lanky 12 pounds, but we'll just have to leave it to the next person who catches that brown to weigh him. Phones were buzzing as the photos and stats circulated the local region. We fished the remainder of the day and were last to load up at the boat ramp. Other fish were caught, even a couple trout that could have been trophies on other days. But we didn't even take pictures of another fish. We were still reveling in the magic that had happened first thing in the morning. That fish will likely carry Josh through the summer and on into fall. But for me, it just piled more fuel on the fire. Much respect. A legitimate, measured thirty incher. Fish of a lifetime, buddy. Nice.